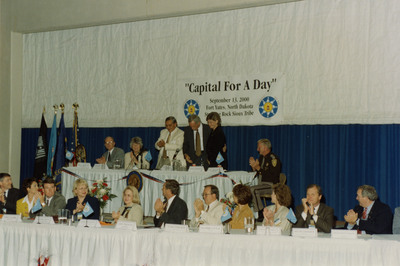 Rosemarie Myrdal and other officials applaud during Governor Ed Schafer's speech at the "Capital For A Day" at Fort Yates in 2000. Seated at the top table, from left to right: Bill Goetz, Myrdal, an unidentified man, Governor Schafer and First Lady Nancy Schafer, and an unidentified member of the North Dakota Highway Patrol. Sitting at the front table from left to right: Tony Clark, Yvonne Smith, Darlene Bartz, Gary Preszler, Tom Freier, Elaine Little, Diane ?, Kevin Cramer, and Bob Martinson.